You can now buy QuietRock 500 1/2" drywall exclusively at selected Lowe's stores. The say that you can "Experience an increase in noise reduction from 25% to 65%, depending on how you use it." 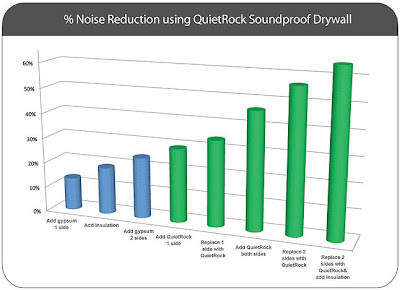 There is no other information provided regarding the soundproofing qualities of QuietRock 500. If you follow this link you will find that QuietSolutions does not provide acoustic tests for QuietRock 500. However, they do provide the chart that you see above. At the price of $29.96, this is the cheapes QuitRock yet. I believe QuitRock 510 is $40 a panel. Visit QuietSolution for a list of stores that carry QuietRock 510.